REDDING, Calif. - A special discount is being offered to Simpson University students, faculty, staff, alumni and friends of Simpson for an 8 p.m. March 4 performance of C.S. Lewis’ “The Screwtape Letters” at the Redding Civic Auditorium. Tickets are $25 (plus fees) with use of the promo code SIMPSON. (Tickets are regularly $40 to $60). A portion of these proceeds will be donated to Simpson University’s Annual Student Scholarship Fund, which provides scholarship funding to students in need. For more information, visit reddingcivic.com or contact the box office at (530) 229-0022. The Redding Civic Auditorium is at 700 Auditorium Drive in Redding. The box office is open 11 a.m. to 5 p.m. Tuesday through Friday. 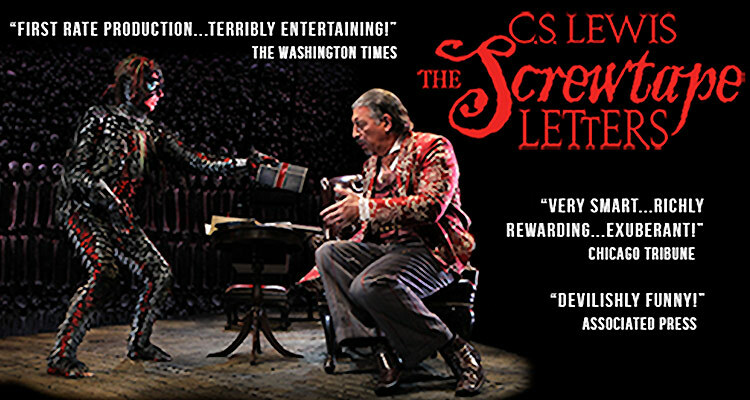 “The Screwtape Letters” is the provocative and wickedly funny theatrical adaptation of the C.S. Lewis novel. It creates a topsy-turvy morally inverted universe set in an eerily stylish office in hell, where God is called the "Enemy" and the devil is referred to as "Our Father below." The play follows His Abysmal Sublimity Screwtape, Satan's top psychiatrist (due to his profound understanding of human nature), and his slavish creature -- demon Toadpipe, as they train an apprentice demon, Wormwood, on how to ruin the life and damn the soul of an unsuspecting human on earth.